Micro-Oil Shampoo is rated 4.8 out of 5 by 5. 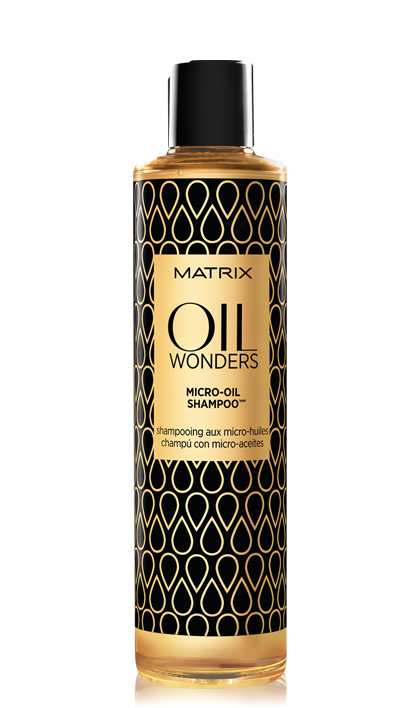 Share https://www.matrix.com/oil-wonders/products/oil-care-collection/micro-oil-shampoo Micro-Oil Shampoohttps://www.matrix.com/~/media/new media library/product listing/filter options/product types/haircare/oilwonders/oilwonders_microoilshampoo_ow-s.jpg Cleansing and nourishment while providing softness and shine. Contains argan oil. Cleansing and nourishment while providing softness and shine. Contains argan oil. Lightweight Oil Wonders Micro-Oil Shampoo, infused with Moroccan argan oil features a unique technology in which micro-sized particles of Moroccan argan oil are evenly dispersed in the silicone based shampoo for gentle cleansing and nourishment while providing softness and shine. Apply to wet hair with a massaging motion. Rinse. Rated 5 out of 5 by Kanniedood from Cannot go back I am like any other woman never satisfied with my hair..I went through them all, and Style Studio Tygervalley is witness to that. What a lovely product. There is no going back. It leaves my hair baby soft, shiny and manageable. The compliments pouring in of how healthy my hair looks. I can be honest in recommending this gem product. Rated 5 out of 5 by Tina12 from Great for Gray Hair I used a sample received from the store. My salt and pepper hair looks awesome, controls frizz and brittle feel. Does not weigh my hair down. Gives a real natural shiny look. Love it. Rated 5 out of 5 by coolcat23 from Works how oil is supposed to! Love the way this makes my hair feel and the shine is fantastic.